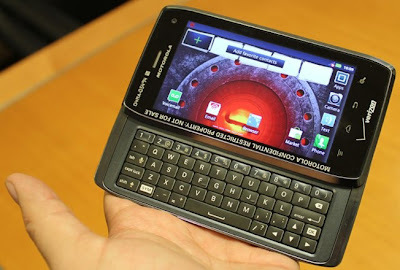 BGR has what appears to be a photo of Motorola's upcoming Droid 4 handset. The fourth edition of the "Droid" family is rumored to have "[s]pecs [that] include a 4-inch qHD display, Android 2.3.5, a 1.2GHz dual-core processor and 4G LTE compatibility." BRG also seems to think that the Droid 4 could be released as early as next week. Motorola Droid Razr is the slimmiest smartphone in the world. It looks cool. It seems like since Google purchased Motorola, they've been throwing out smartphones weekly. I wonder if the next line of Nexus devices will only be manufactured by Motorola? Something to think about. I've been using Motorola phones for 15 years, and I had the old regular razr thin phone. So I was pretty excited when this new Droid came out.